People, product and process are the three ‘Ps’ marketers must focus on if they’re to create a comprehensive and mature digital marketing strategy, according to Adobe’s chief of strategy and digital marketing. During his opening address on day two of the Adobe Digital Marketing Summit in Salt Lake City, Adobe’s John Mellor said that while product, or the technology capability to interact using digital channels, was recognised as vital to success, it’s also important to align process and people behind the customer vision. “These three things – product, process and people – either drive our organisation or create drag; they either drive us, or drive us nuts,” he told attendees. Marketers should also promote broader awareness of these three Ps in a way that deconstructs what component each means for their corporate peers and showcases its value, Mellor continued. “You have to have process to expand across the organisation, that allows your digital marketing team to interact in formal ways across those other departments in the enterprise that are tied to our success,” he said. To help organisations gauge their digital maturity and improve their game, Adobe has crafted the a Digital Marketing Maturity Assessment for organisations built around 44 key questions which break down the new three Ps and help develop business strategy. The questions allow companies to benchmark themselves against the industry’s best, as well as tease out where the performance gaps are around process, people and product development, Mellor said. Five hundred customers have taken the assessment so far and based on the results, Adobe has devised a relative performance scale around the three Ps. For example, the average score for organisations around people is 2.2, while the best in class (top 20 per cent of companies) score is 3.5. The assessment is now being rolled out in Australia. According to Mellor, areas where organisations are still struggling include attribution, content creation, and being able to talk consistently about a marketing investment’s impact on the greater business good. Other product gaps include capabilities around data integration and campaign automation. “In most cases, we found there are good segments being used to communicate across [customer] groups, but just to define segments across groups and use that category across several groups is a powerful thing,” he commented. When it comes to the people part of the equation, Adobe found many organisations claim to have well documented strategies, but are looking at how to get more people and more skills into their organisations. According to the vendor’s latest Digital Roadblock: Marketers Struggle to Reinvent themselves report, top hurdles to becoming a digital-savvy marketer include access to training in new marketing skills, as well as an organisational inability to adapt to new market conditions. The importance of people and process was illustrated by Adobe’s two keynote customers, FedEx and MGM. At casino, hotel and leisure resort giant, MGM, the executive team has been restructured as part of an initiative to drive holistic and tailored customer experiences, its senior vice-president and chief digital officer, John Bollen, said. At the top of the MGM tree is the chief customer officer, rather than a CMO. Reporting into the CCO are the CDO, chief guest officer, chief loyalty officer and a VP of brand and marketing. “There is no digital playbook, but we realised we needed to reorganise success and do things in a different way,” Bollen said. Today, the number of indirect interactions consumers have with MGM’s portfolio of brands surpasses direct interactions, an indication of the vital role digital plays in customer engagement, he said. Bollen also pointed out 70 per cent of decisions are made by customers about brands before they even interact with them. In addition, a guest for MGM is the never the same guest twice, Bollen said, and can require different experiences depending on time, the duration of their trip, if they’re repeat versus new visitors, or if they’re restaurant customers or hotel guests. “Once we thought of customer experience as a linear process but we’ve realised it’s an iterative process before, during and post-trip,” he explained. MGM has now devised its own guest experience platform approach based on four milestones: Customer touch points, guest expectations, the underlying technology functions (product), and guest experience management (people and process). “The experience for the customer has been disjointed and disconnected. We want to shift to continuous experiences that are personal to you, and that are integrated and frictionless,” Bollen added. 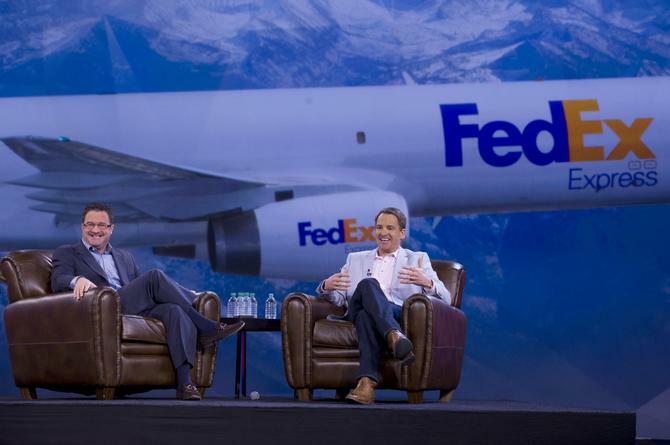 FedEx chief of customer experience, Mike Rude (pictured, left), said the logistics company took a significant step forward with digital when it established an interactive marketing group, which in turn created Web analytics, search and other foundation skills to drive a better customer approach. Its in-bound marketing team then architected the wider discipline. “Customers want us to interact with them on their terms, which change by the day, and even by the hour,” he said. “The other component to this is when you ‘curate’ an experience for the customer, you’re creating an atmosphere that meets the person’s needs at the time. To do this, all channels have to be tied together and bonded by digital.